Watch an AIDS activism drama, see last year's Cannes favourite and follow Jean-Luc Godard's famed affair in a biopic. French filmmakers are a busy bunch. Every year, the country's cinematic talent pumps out nearly 300 new movies — enough to rank among the top five film-producing nations in 2016, behind only India, the US, China and Japan. It's no wonder, then, that New Zealand's annual Alliance Francaise French Film Festival is always jam-packed with flicks, spoiling viewers for choice when it comes to Gallic cinema's latest and greatest. The fest's team clearly has plenty of picks to choose from, with their 2018 event touring 37 features around local screens until the end of March. Sitting pretty on this year's highlights list is Ismael's Ghosts, which sees three of France's most gifted actors face-off on the big screen; BPM (Beats Per Minute), which comes direct from the Cannes Film Festival; plus opening night comedy C'est la vie! from The Intouchables duo Éric Toledano and Olivier Nakache. In short: there's more than enough on offer to make you think you're on the other side of the world, and not just in your nearest cinema. And if you need some help deciding what to see, that's where we come in. When last year's Cannes favourite (and award-winner) BPM (Beats Per Minute) didn't make this year's Oscars shortlist for the best foreign-language film category, it was considered quite the shock. Come French cinema's own night of nights, the Césars, and the AIDS activism drama fared much, much better, taking out best film, editing, screenplay, score, male newcomer and supporting actor. It's easy to see why, the latest from Eastern Boys' filmmaker Robin Campillo is both intimate and wide-ranging as it explores the efforts of a passionate group to fight for acceptance and affordable HIV treatment in the early '90s. The writer-director himself was a member of ACT UP, the organisation at the movie's centre, adding an extra layer of authenticity — something the film already oozes courtesy of its naturalistic style, personal approach and exceptional performances. Another year, another Isabelle Huppert film in the AFFFF program. Anything else really is virtually unthinkable. The adored French star actually features in two of this year's festival flicks, but if the prospect of seeing the inimitable actress in a version of Dr. Jekyll and Mr Hyde doesn't get you excited, then nothing will. Lighter in tone than Robert Louis Stevenson's literary classic, and filled with commentary about class clashes in contemporary French society as well as laughter, Serge Bozon's effort is set within a Parisian high school. It also features a pivotal lightening strike and sees Huppert's stressed teacher undergo quite the transformation. French singer Barbara gets the biopic treatment in the film that shares her name, but it's also much, much more than that. The third feature directed by actor-turned-filmmaker Mathieu Amalric, it's a tale about an actress (Jeanne Balibar) preparing to play Barbara in a biopic, and a director (played by Amalric) who's obsessed with his subject. Yes, there's a film within a film, as well as archival footage of the real figure herself, just to keep things even more ambitious. Adding further layers to the flick, Balibar — who just won the Cesar for best actress for her excellent efforts — was once married to Amalric. What's the French Film Festival without a dose of French film history? This year, they're delivering it in biopic form, focusing on one of the country's great directors and pioneers of the French New Wave. 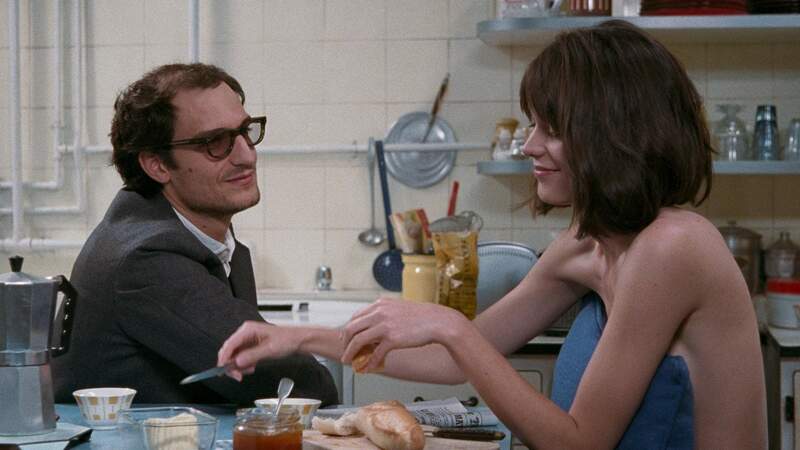 In Redoubtable, Louis Garrel steps into Jean-Luc Godard's shoes, following his relationship with his Weekend and La Chinoise muse Anne Wiazemsky (Stacy Martin), his career in the late '60s, and the surrounding French political and social unrest. Plus, for director Michel Hazanavicius, it's a return to making movies about movies after his Oscar-winning The Artist. Another AFFFF favourite — but behind the lens — François Ozon (Frantz) is back in psychological sexual thriller territory with Double Lover. Yes, as the name gives away, there's duplicity involved. It's rarely a good idea to fall in love with a psychoanalyst in these kinds of films, so when former model Chloé (Marine Vacth) does just that with Paul (Jérémie Renier), there's unexpected consequences. Fans of Swimming Pool, In the House, Young & Beautiful and The New Girlfriend will know just the mood, tone and simmering unease they're in for, as well as the all-round provocative air. Films about filmmakers are a definite trend at this year's AFFFF. And not just that — films starring Mathieu Amalric as a filmmaker, too. The aforementioned Barbara director and star plays the titular Ismaël in Ismaël's Ghosts, who's just about to get immersed in his latest project when the past comes calling. Also featuring Marion Cotillard, Charlotte Gainsbourg and Redoubtable's Louis Garrel, the movie is the latest from My Golden Days' Arnaud Desplechin, and opened the Cannes Film Festival last year. The Alliance Française French Film Festival runs in Auckland from March 1-21 at Rialto Newmarket and Berkeley Cinemas Takapuna, and in Wellington from March 7-28 at Emassy Theatre. For full program details including screening times and ticket information, visit the AFFFF website.